Summer is pretty much here, at least where I live. It's in the 80's everyday so it may as well be summer. I know it's going to get a lot hotter and it already is a lot hotter in some places. That means sitting outside with friends and having fun. S'mores are part of summer fun. The best part of these is that they can be made ahead and don't involve a flame (although I'm sure you could if you wanted too). You could always roast actual marshmallows and put them in between the cookies of course. That may be delicious too. 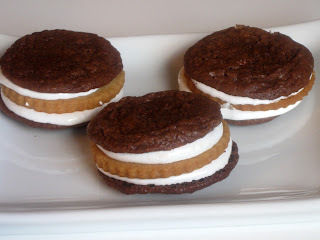 These involve homemade graham crackers (if desired) and brownie cookies! I made my brownie cookies first to see how big they would spread then made my graham crackers with the corresponding cutter so that they would be the same size. If you want to you could always just buy graham crackers and call it a day. I prefer to be over-industrious pretty much all of the time. You're probably lucky I haven't tried to make the marshmallow fluff from scratch (but maybe I should?). 2. Mix together butter, sugars, and vanilla on medium speed in mixing bowl until lighter in color and slightly fluffy. 3. Add egg, mix until well combined. 4. Add flour, cocoa, and salt into butter mixture, stir until mixed. 5. Stir in mini chocolate chips. 6. Scoop tablespoonfuls about 2” apart on a baking sheet. Bake 11-12 minutes. Cool on wire rack. 7. Scoop about 1 tablespoon of fluff on the insides of two chocolate cookies. Place a graham cracker on top of one cookie then top with the other cookie to make a “sandwich”. What a great recipe! Love how you turned them inside out. So creative! oh yum yum! Thanks for linking up to Southern Sundays! Hope to see you again next week! 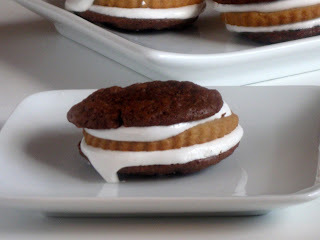 OMG these look good, and you so should make your own marshmallow fluff it's really easy! 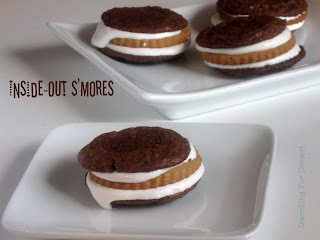 Inside out smores? Those are so fun looking!!! I want about 6 of those!!! These are adorable! I love this idea :) Pinned!